Today’s Comic Art Friday extends belated birthday wishes to longtime comic book inker Joe Rubinstein, who celebrated his 51st birthday yesterday. Joe was the artist who took on the very first inking job I ever commissioned, back in the days when I was an art collecting newbie and terrified to let someone touch one of my pristine pencil pieces. 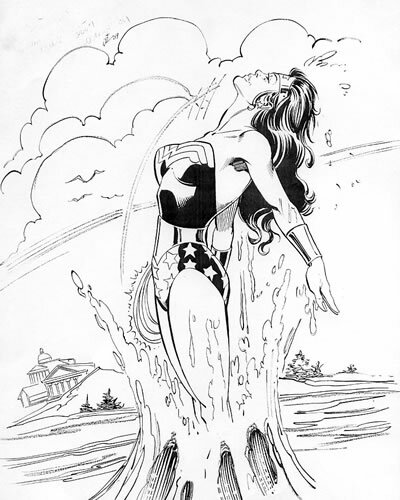 Since then, Joe has lent his considerable talents to a dozen other pieces from my collection, always displaying the smooth line and graceful style that has been a hallmark of his comic book oeuvre since the early 1970s. Now, let’s take a peek at Joe’s latest commission. 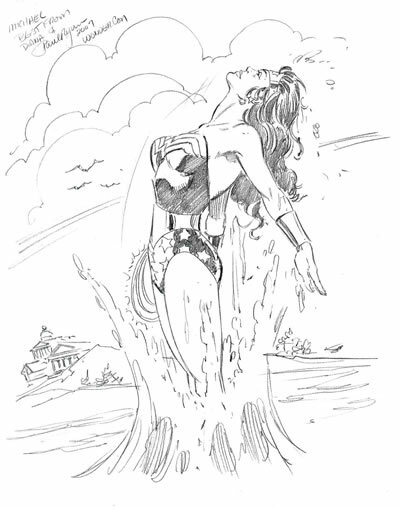 Paul Ryan, a delightful gentleman as well as a phenomenally gifted artist, drew this dynamic pencil sketch of Wonder Woman — a favorite heroine of Paul’s as she is mine — at WonderCon 2007. I recently placed this beauty in the hands of the redoubtable Mr. Rubinstein. Below is the spectacular result. Thanks, Joe, for yet another fine commission. Here’s hoping we’ll get to do a dozen more together. Speaking of inkers, balloting for the Inkwell Awards is currently under way. These annual honors for comic book inkers are spearheaded by one of the best, my friend and frequent commissionee Bob Almond. If you’re an aficionado of comic art — and specifically of the underappreciated specialty of inking — please drop over to the Inkwell Awards site and cast your votes for your favorite inkers. You’ll be glad you did! This entry was posted on June 5, 2009 at 12:19 am and is filed under Comic Art Friday. You can subscribe via RSS 2.0 feed to this post's comments. You can comment below, or link to this permanent URL from your own site. Michael, I just figured out you moved your blog! I kept clicking on the old one, and was worried about the long silence. Then today I noticed that your old blog was showing more recent Tweets, which led me here. Sorry about the redirection. Blogger went haywire a while back, and stopped allowing me to update the old SSTOL via FTP. After nattering and grommishing for a couple of weeks, I relaunched the blog here.